Marissa, Volunteer Babywearing Educator with BWI of Central Iowa, and Tula enthusiast highlighted some important points regarding fit and styles of Tulas available. Soft Structured Carriers (also known as SSCs and buckle carriers) are one of the five main types of carriers that we work with at our meetings. There are many awesome brands of SSCs out there to try (Beco, Ergo, and Kinderpack, just to name a few) and you’ll find that some work better than others for you depending on your build and the age/size of your child. It’s no secret that Tula is a personal favorite of mine, but with all the different options, it can be confusing to know which Tula will best suit your needs. With the help of some awesome graphics and information from the Tula Love Facebook group, I’m going to try to answer the most common questions surrounding this popular brand. Officially, Tulas come in two different sizes, standard and toddler size. However, it’s important to remember that the size can vary a few inches from one carrier to the next since they are handmade. As a general estimate, the standard size Tula is 15.5 inches tall and 14.5 inches wide and weighs in at 2 lbs. It is recommended for babies 0-18 months and 15-24 lbs. An infant insert is available is available for an additional cost for smaller babies that are not 15 lbs. The toddler size Tula, on the other hand, measures in at approximately 18 inches tall and 19 inches wide. It is recommended for babies and children 18 months- 4 years of age and 25-45 lbs. Most of the time, the height of your child matters more than the weight when deciding which Tula to purchase. As a general rule, once your baby or toddler is 31” tall, he or she will begin to fit knee to knee (without his or her legs being overextended) in the toddler size Tula. That does not mean, however, that you necessarily have to size up at that time. Many children continue to fit well in the standard size until age 2 and beyond, depending on the child’s size, and there are even leg extenders available for purchase on Tula’s website to help the child remain knee to knee longer. The only reason you really need to size up is if the panel of the carrier does not come up high enough on the child’s back anymore and they risk being able to lean out of the Tula. My son is a leaner and quite tall for his age, so we encountered this problem when he was about 18 months old. We bought a toddler size Tula at that point and have been comfortably wearing ever since. In addition to the two sizes available to purchase, Tulas also come in different varieties (with different price ranges) based on how much woven wrap is used to construct the carrier. 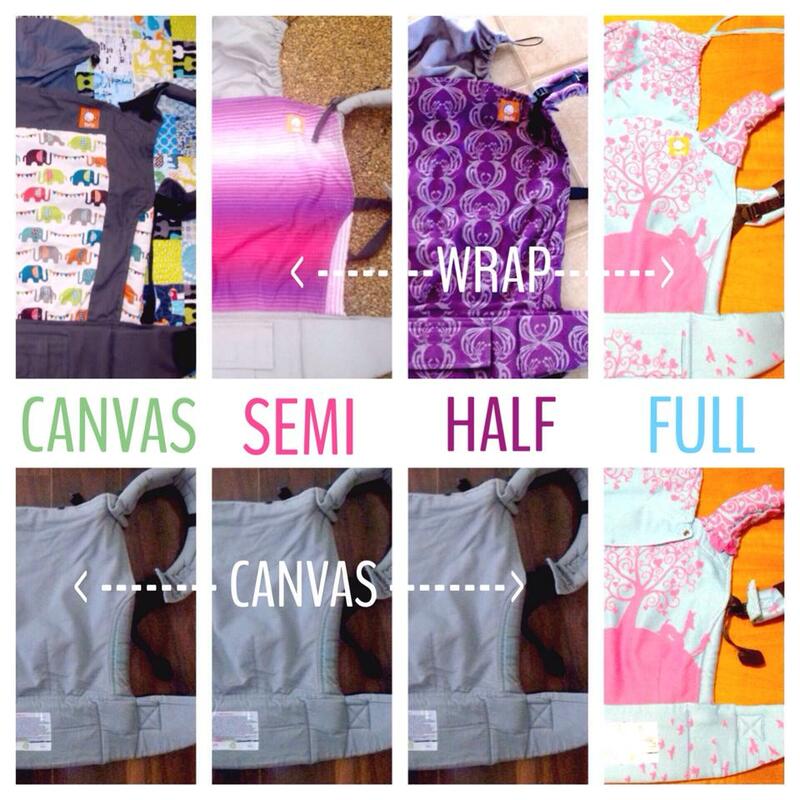 The all-canvas Tula is the most widely available and comes with the lowest price tag. You can find these for purchase on Tula’s website as well as through various online retailers. They are made completely of canvas material and come in a variety of colors and patterns. The standard size usually starts around $149 at retail and the toddler size usually starts around $169 at retail. The semi and half wrap conversion Tulas are partially made of woven wrap and partially of canvas material. The half wrap conversions have more woven wrap material on them (covering the front of the straps, panel, and waist band) than the semi wrap conversions do (just covering the front of the panel). The retail cost of these varies based on what type of woven wrap is used and how much of it is used. The full wrap conversion Tulas are made entirely of woven wrap, with no canvas material at all. These are usually the most expensive Tulas at retail. The lack of canvas often makes them very cuddly and soft, but depending on the wrap used, they can also be less supportive for older or heavier children. Wrap conversions in general are quite a bit harder to find at retail than the all-canvas Tulas. Tula puts a few dozen wrap conversions up on their website every other Sunday at 5 p.m. CST, but they usually sell out in less than a minute. You can also find canvas and wrap conversion Tulas available used on various Facebook swaps, but the prices may be higher than retail. In my personal opinion, there isn’t a huge benefit to getting one type of Tula over another. The canvas Tulas are just as comfortable and amazing as the wrap conversions, but the wrap conversions sure are beautiful! It’s all about personal preference and taste. One more point to consider is that the new toddler Tulas all have the “standard waist” (meaning the waist on the toddler size is the same size as the waist on the standard Tulas) while the older ones have larger waists. If you are purchasing a new toddler Tula, you will get the new, smaller waist, which is still a great fit for people of all sizes. 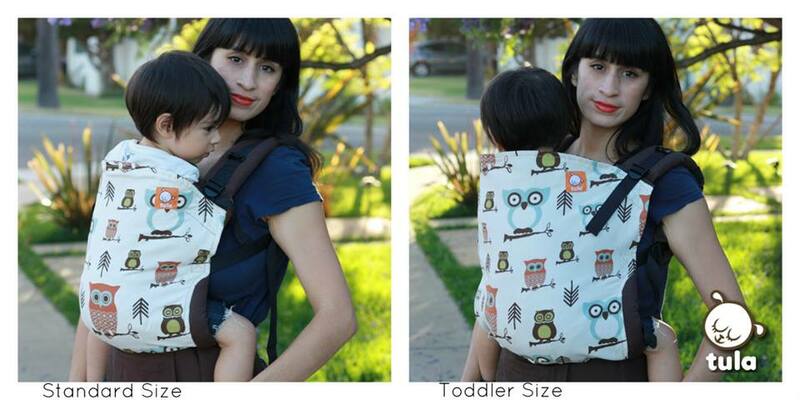 When purchasing a toddler Tula used, however, you will want to ask which style waist it comes with. If you are a petite person who needs a toddler size Tula, I would recommend going with the new, standard waist. Babywearing International of Central Iowa currently has two canvas standard size Tula and one canvas toddler size Tula in their lending library. If you are unsure about the fit of your SSC, please come to a meeting and get help from a Volunteer Babywearing Educator. I hope this guide helps you to find the perfect Tula for you and your little one. Happy babywearing! !